Structure-based drug discovery (SBDD) is becoming an essential tool in assisting fast and cost-efficient lead discovery and optimization. The application of rational, structure-based drug design is proven to be more efficient than the traditional way of drug discovery, since it aims to understand the molecular basis of a disease and utilizes the knowledge of the three-dimensional structure of the biological target in the process. Virtual screening is a method of structure-based drug design, where large libraries of drug-like compounds that are commercially available are computationally screened against targets of known structure, and those that are predicted to bind well are experimentally tested. Aldehyde dehydrogenase 7A1 (ALDH7A1) is linked to lysine catabolism, protects against hyperosmotic and oxidative stress and is overexpressed in a number of cancer types. The emergence of ALDH7A1 as an important cancer biomarker and its potential therapeutic use, highlight the need for the development of selective inhibitors for this enzyme. However, no antagonists have been developed that inhibit each ALDH isozyme without affecting other isoforms. The only known ALDH7A1 inhibitor to date is 4-diethylaminobenzaldehyde (DEAB), which has been recently crystallized complexed with ALDH7A1. 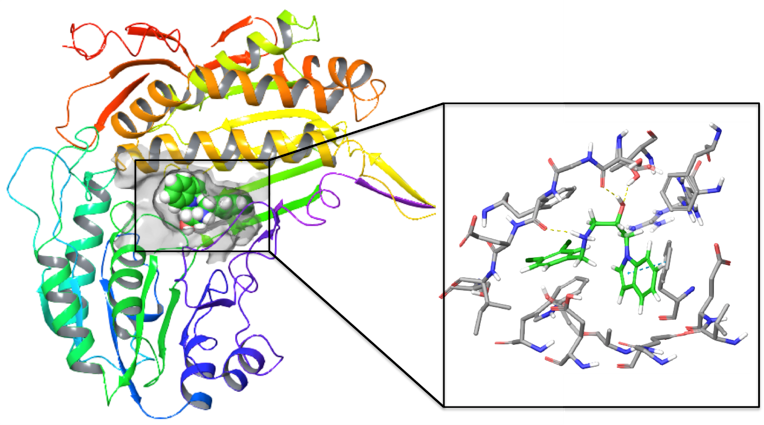 In this project, we will use the freely available AutoDock4 to virtual screen a library of 30M compounds against the protein’s two binding sites in order to identify novel inhibitors of ALDH7A1. ALDH7A1 is linked to lysine catabolism, protects against hyperosmotic and oxidative stress and is overexpressed in a number of cancer types. Here we propose to perform a virtual screening exercise on human ALDH7A1 to discover small-molecule inhibitors of ALDH7A1 by docking a drug-like database in the ALDH7A1 binding sites. Learn how to setup and perform computer-aided drug design simulations. Perform Virtual Screening (VS). Setup a workflow to perform VS on HPC facilities. Basic programming skills and Linux would be desirable. Week 1. Perform docking Tutorial. Familiarize with linux. Week 2. Setup the protein system. Read the literature on ALDH7A1. Week 3. Submit the Work Plan. Familiarize with HPC resources on ARIS, creating and running batch scripts. Week 4. Create a workflow to submit AutoDock4 calculations on HPC. Week 5. Submit virtual screening calculations on both binding sites of ALDH7A1. Week 6. Postprocess the virtual screening results. Week 7. Rationalize the results and select candidate compounds for experimental testing as inhibitors of ALDH7A1. The project can be made more difficult depending on the analysis that will be performed. The project can be made less difficult by choosing easier analysis. The student will need to have access to ARIS supercomputer facility, the necessary software and analysis tools to run and analyse the trajectories. Local resources for analysis will be provided (office space and desktop).